This 2009 vintage is made from Scottish barley, which is organic just like the rest of the process, and matured in American oak. Sweet hay in the smell. A bit of oak, vanilla and marzipan. Sweet white fruits mixed with loads of vanilla in the taste. The vanilla carries on to the finish, where some farm-like notes joins in. The oak is subtle but great, with some oak spices coming through as well. 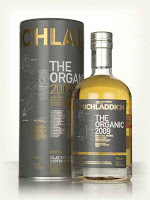 This shows that unpeated Islay can be quite okay as well, and the farm-style character suits Bruichladdich - as always. Glad that we have a couple of unpeated choices from Islay. I will give this 85/100 (21/21/22/21).